Today, when a US journalist asked, ‘What’s your favourite card in the whole Game of Thrones tarot deck?’ I was momentarily stumped. ‘Favourite’ has a load of connotations for me, as in which baby out of all the cards is best. I can’t answer that one. When I switched the question to ‘Which do I feel most passionate about?’ there is a card that, for me, pulls at the heartstrings. One could even call it ‘uplifting’ (yes, there is a heart-warming moment amidst the chaos of beheadings, betrayals, and blood…): it’s card VI, The Lovers, which depicts Jon Snow and fire-kissed Wildling Ygritte atop the Wall (Kit Harington and Rose Leslie). After a hair-raising, perilous climb that almost kills them both, the sun illuminates a truly magical vista. As Ygritte says, “I’ve waited my whole life to see the world from up there.” They kiss, grateful for their survival and for each other. This scene just had to be our chosen scene for Game of Thrones Tarot Lovers. 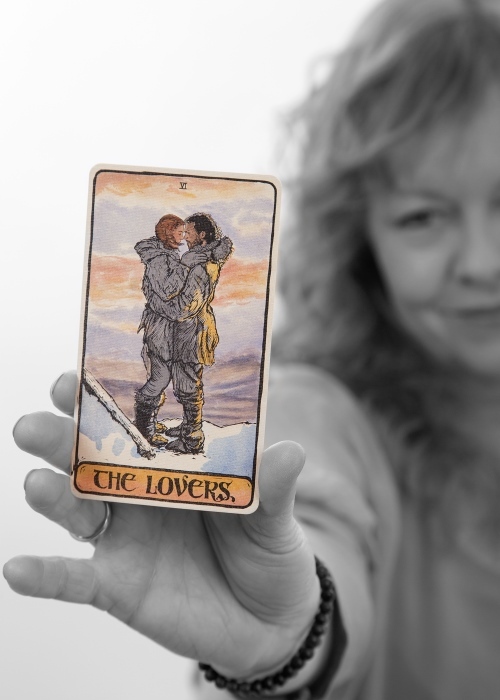 The kiss depicted so beautifully by artist Craig Coss on the GoT tarot Lovers card captures a timeless moment when love is perfect. We know their time together is precious which, for me, makes the card all the more evocative. As tarotistas will know, the Lovers card also begs a decision. Jon and Ygritte may be together now, but tribal allegiances divide them – and eventually tear them apart. Now that, indeed, was a good prediction.